-firstly, exactly how strong is aluminium? i've done my homework and found that it had a brinells modulus of 245Mpa and tensile modulus of 70Gpa. the problem is that i am not sure how hard it actually is. could someone give me a comparison and description of it? thanks! really appreciate it! Some alloys of aluminum have the same strength as mild steel, with a weight of about 1/3 the steel. Alloy and high carbon steels can be much stronger and stiffer than aluminum, and some aluminum alloys are much weaker than others. There is more information that tensile strenght. Look at modulus of elasticity too. You must thouroughly check your design especially if stiffness or weight is important. Aluminum tends to have a definate fatigue life, even when operated in elastic loading. Steel tends to have an indefinite, and sometimes "infinite" fatigue life when operated in elastic loading. I would suggest you locate examples that aluminum and steel are both used such as bike frames, on-road trailers, camera tripods, and lawn furniture and compare them for design considerations, then apply these considerations to your designs and see if aluminum is approprate. In my experience when aluminum is used for bike frames -especially mountain bikes, and trailers, it will fail much faster than steel. I used to be a TIG welder that specialized in aluminum years ago. What is the application? What alloy? Heat treated? Too many variables to give one answer. If it alclad that lowers the numbers slightly. It also is sensitive to the grain direction if you are bending it and requires a bend radius to avoid cracking. Aircraft undergo extensive inspections at specific intervals to avoid metal fatigue failures. If you take 7075-T6 and forge it..then it is not as strong as the numbers above ...just like forging a hand file...after heat is applied you have to start over for hardness. Benjamin...what do you intend to do? We made many railings in Florida out of 3003 and 6061 alloy....though we cared little for strength afterword provided it was good enough for the railings so we did no post forging heat treatment. Are you asking how HARD or how STRONG aluminum is?? These two terms can mean VERY different things!! If you are referring to aluminum's HARDNESS (such as Rockwell A/B/C scales, Brinell, etc.) then it is quite soft. Obviously, various grades and forms of those grades will differ but in general, aluminum is soft. You definitely won't be making a knife out of it any time soon.... Far as STRENGTH goes, the different grades vary SIGNIFICANTLY as Frozenforge has said. Structurally, aluminum (given the proper grade for the application) can be equally as strong as structural (A36) steel with roughly 1/3 the total weight. The strength of aluminum drops when welded especially certain alloys that are heat-treatable alloys such as 6061-T6, which is a very commonly used material. The right questions get the right answers. As a rule of thumb, aluminum is 1/2 the mass and strength of steel. Now, yes some alloys are stronger than mild steel, but if you compair high streamgth steel to high strength aluminum and mild steel to low alloy aluminum it still hold true. The advantage is in the engendered shapes, if the material is ectruded in the right shape, you can achieve aproximently 3/2 the strength for a given weight. We are talking tubing, I beam, Chanel etc. in this case it isn't the strength of the material as the inherant stiffness of a larger cross section. Also important is that most alum is very heat sensitive. 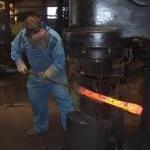 To gain strength many alum alloys are heat treated or hardened in some manner. With some alloys even heating the material about 300 deg F can destroy the added benefits of any treatments applied to the alum. Once lost it can't easily be "repaired" unless you have the right tools to do the job.